So, it’s been a while. I’m working on a film, which tends to keep me very busy. The holidays kinda swept me up as well (still haven’t taken down the decorations, let’s add that to the to-do list) and then there was my birthday. As I’ve said before, I selfishly consider my birthday to be the true New Year’s day since it’s a week into each new year. For the past few years, I’ve been working on a project that I was both incredibly aware of and a bit unconscious to: birthday tattoos. I established rules for myself because I realized from the get-go that I would get addicted to body art. Rule #1: Don’t get a tattoo you haven’t considered for at least a year. For me, this meant designing all of my tattoos with the artists who tattooed me. Nothing from the wall. Rule #2: Only get tattoos on odd-numbered birthdays until your 30th, when all bets are off. So, starting with my 25th birthday, I’ve gotten a tattoo every other year on my birthday. I broke both my rules only once by getting a tattoo of a fleur-dis-lis on my foot. It wasn’t my birthday, and I hadn’t really thought about the tattoo much before I got it. The only other time the rules were broken was last year, on my 29th birthday when I got my Ganesh tattoo. After work, I rushed to Hell or High Water to get my tattoo and shortly after I arrived, the power went off because there was a devastating fire at a church nearby. I ended up getting it the next day, January 8th, right before the Saints lost their playoff game. It’s ironic that there were so many obstacles to getting that tattoo of Ganesh last year: since he is known as the remover of obstacles. But he is also the Lord of Beginnings and a patron god of artists and writers and so he is very special to me. 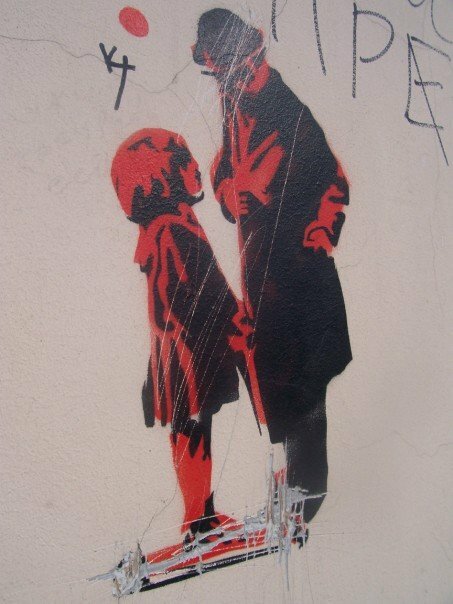 As many of you may know from reading this blog, Banksy is also pretty special to me, including my favorite Banksy graffiti/art. 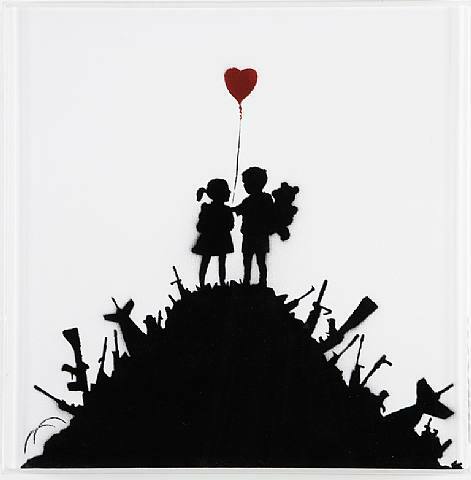 While I like a lot of Banksy’s work and he intrigues me, there’s really only one image of his that I like enough to tattoo it – forever – on my body. This image invokes hope and childhood, but also poignant nostalgia and unfulfilled desire. It is immediately evocative for most people who see it, yet it is a complete contradiction, both delicate and stark. Of course it would become part of my birthday tattoo project. I went to Hell or High Water again and while Tony was tattooing me, he surprised me completely by asking me why I’ve gotten all my tattoos. I don’t strike most people as the type, I know. How did I become a girl who has five tattoos? And why? My brother is covered in tattoos and I don’t think anyone’s questioned why he’s gotten them. It just seems like a natural extension of his personality. Well, actually, I know our family has questioned WHY he’s gotten so many tattoos and while they disapprove, his tattoos probably do make more sense to them than mine make. But that’s okay, because they make sense to me. My tattoos are each important reminders to me that I am always seeking balance in my life between extreme contradictions in the world and in myself. Which is why, except for my first, most of my tattoos are visible to me. 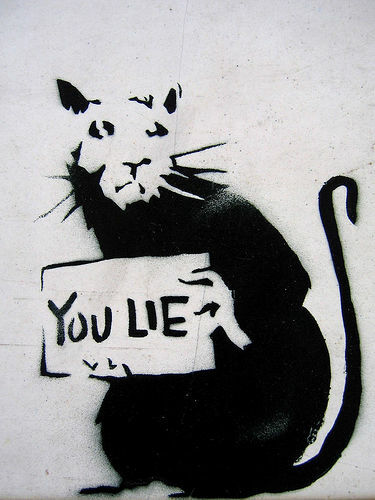 When Tony and I were discussing the placement of my Banksy tattoo, I stressed how important it was that my tattoo be facing me, something I could look at whenever I wanted or see accidentally. He came up with a brilliant placement for it that accomodated the necessary size. I told Tony this was my only tattoo that I hadn’t designed in some way, the closet to an “off the wall” tattoo, one that any number of other people are also carrying around on their bodies. He told me how much he enjoyed Exit Through the Gift Shop and we started joking about how Banksy sort of stole the documentary that started out about him. 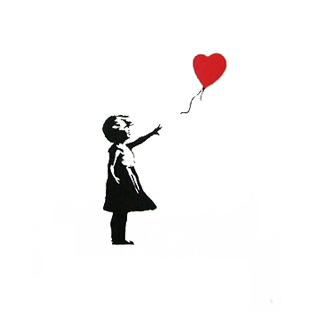 Ultimately, we decided that Banksy should make another documentary, this one about the people who tattoo his work on their bodies. I would watch that documentary and it really seems like something he would do. 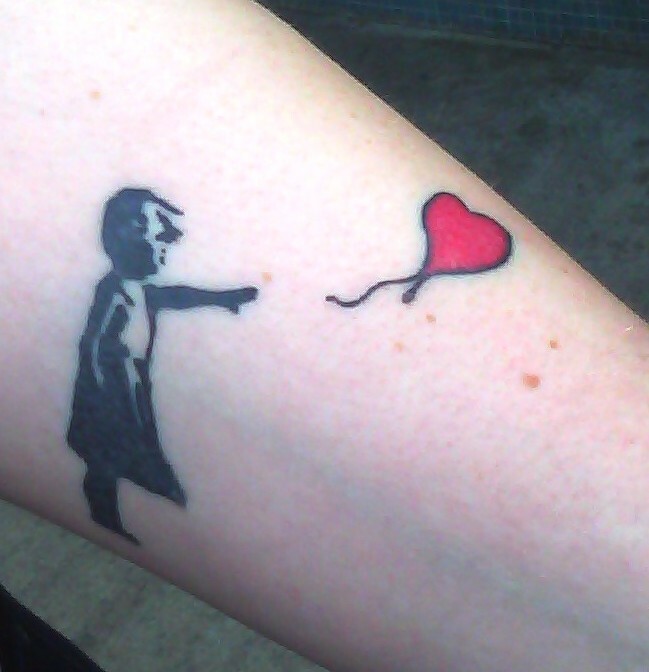 Shortly after getting my Banksy tattoo, I realized that it may very well be my last tattoo. It might not be. Who knows? But the birthday tattoo project is over. I got 5 tattoos between the ages of 25 and 30. They were done by 5 different tattoo artists at 4 shops on 3 of my important birthdays and in 2 different cities. All of these tattoos have a central theme of balance and they remind me daily of things and people I love. They also remind me of who I have been and who I want to be. I’m happy with the results. 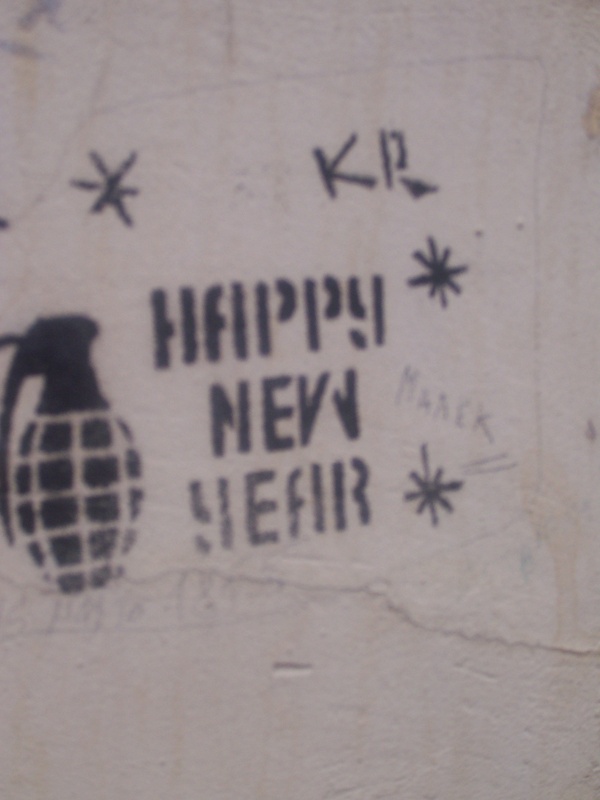 Last year, I wrote a giant post that mostly discussed street art in general and Banksy in specific. 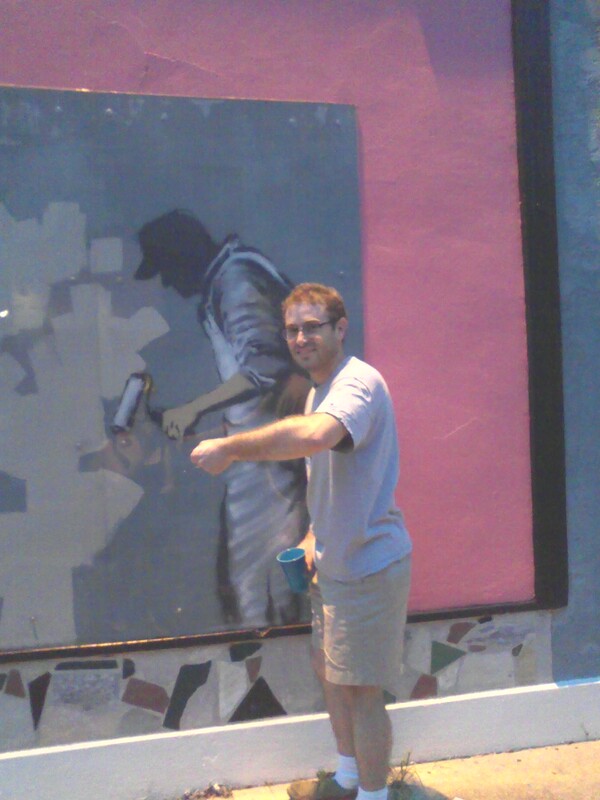 It bounced around a few topics that seemed related to me and was at least loosely connected – street art, Banksy, my volleyball teammates, my time in St. Petersburg, Russia with SLS. 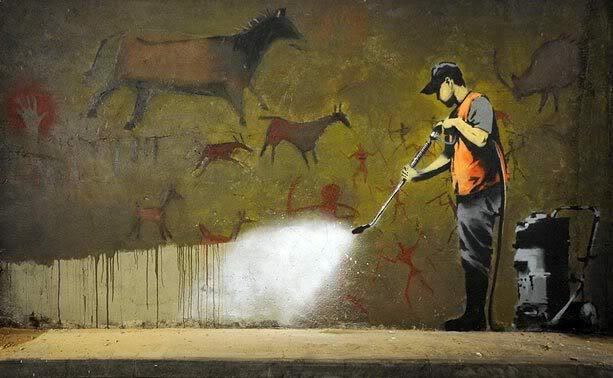 Before I wrote that post, I was lucky if I got 20-30 hits a day on this blog, but since then, I’ve seen a leap in traffic and searches like “banksy,” “banksy pictures,” and “robin banksy.” Most of the searches are pretty standard, though there was a few of “бАНКСЫ" searches and I did see an odd one recently – “gross vandalism art.” Kinda intriguing. 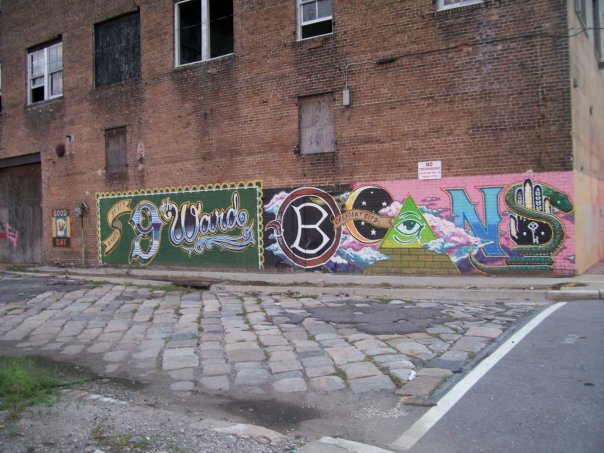 Earlier this year, I revisited the idea of street art, particularly one of the images I’d included in that first post and the story of a friend of mine’s mural. 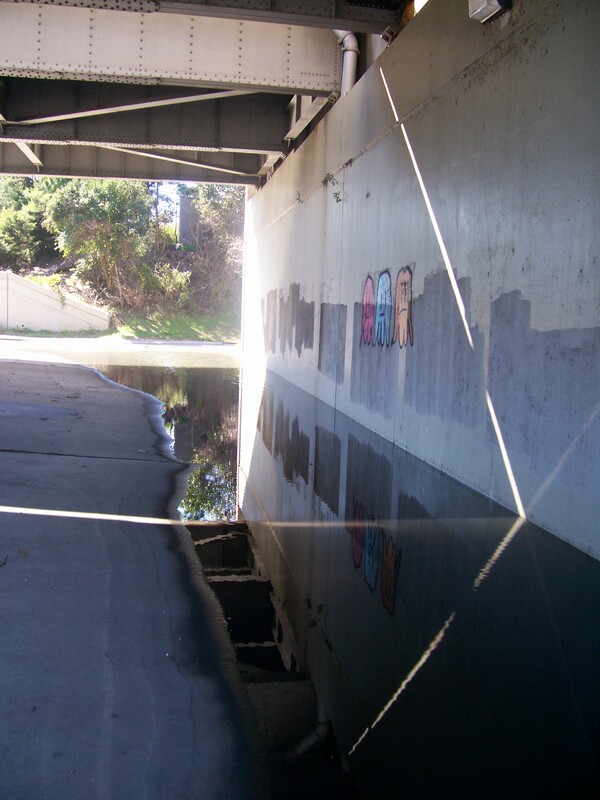 I’ve been meaning to write a true follow-up to the first street art post, because I stumbled on a lot of new information (and street art) since then. Where do I start? And of course, I found out about the documentary Exit Through the Gift Shop, about Banksy taking over the documentary a guy was trying to make about him. I’ve been waiting eagerly to see it. When our most arty theater, Canal Theaters, was under construction, I thought there was no way I’d get to see it on the big screen. Then, oddly enough, a friend discovered it was playing at the recently renovated and re-opened Chalmette Theaters. This theater, like most everything else in Chalmette, was destroyed during Katrina. And it wasn’t easy to figure out where this theater is or what the showtimes were, let me tell you. My friend and I and a co-worker all had to investigate and then, of course, I had to drive out in a rainstorm to Chalmette, not really knowing my way. Anyway, I’d do it all again because it was an awesome experience. It should be said that the Chalmette Theaters is open, but only just. When I first walked in, I obviously walked in the side that’s not yet renovated and open for business. It was a big empty shell. When I found my way out and inside the open side of the theater, everything was glitzy and great, still smelling of fresh paint. It was, for that surreal reason alone, probably the best possible place I could’ve seen Exit Through the Gift Shop. The movie was absorbing and really smart. 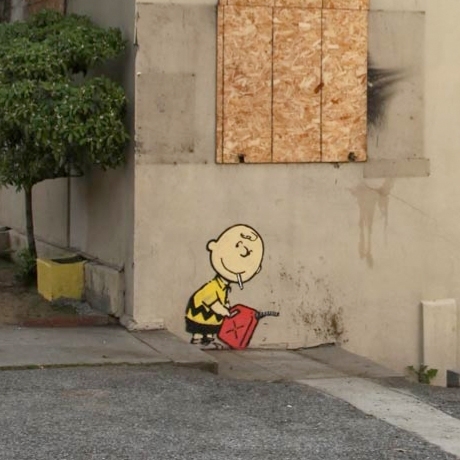 I only wished it had something about Banky’s visit to New Orleans. 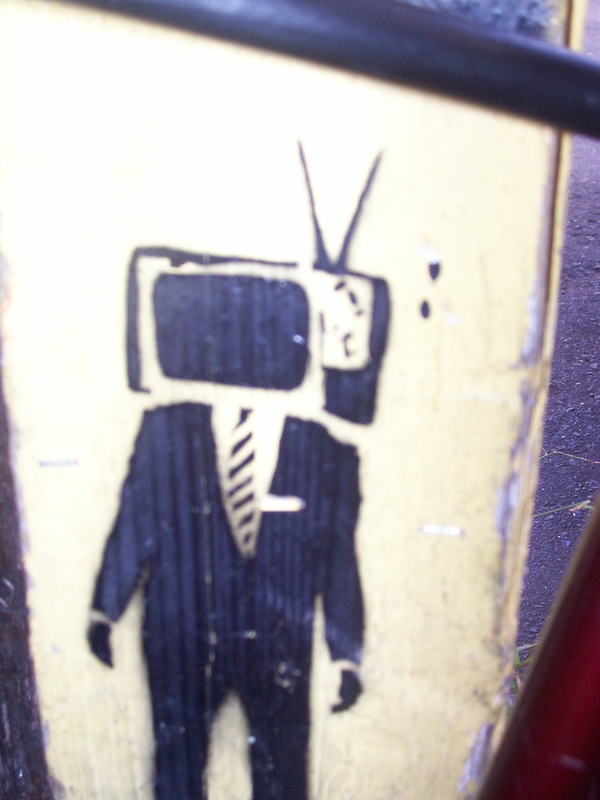 Anyway, I don’t want to give too much away by detailing everything that happens, but if you’re a geek for street art like me, it’ll be your thing. When it was over, my mind was reeling. 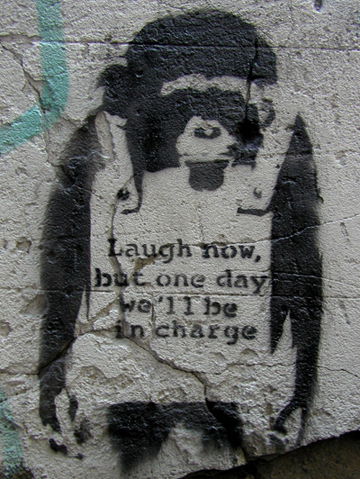 Me and the unexpected middle-aged white guy walked out together and had a tiny conversation about what we thought of the film and I left feeling freaked out, amused and very excited about street art, about New Orleans (and Chalmette) and re-inspired by Banksy all over again. Everyone’s talking about the Banksy-directed film, Exit through the Gift Shop, which showed at the Sundance Film Festival and tracks the antics of street artist Mr. Brainwash. Also getting some press: the London band named Exit through the Gift Shop, which has understandably benefited from some free publicity. The similarity in names was apparently a coincidence, with the band having been founded a few years ago out of the “midlife crisis” of band member, 41-year-old web developer Simon Duncan. Call it a happy coincidence though. According to the Guardian, Duncan’s band started receiving “hilarious emails from someone saying he was Banksy,” asking for them to change their name. Soon, in return for changing his band’s name to Brace Yourself, a white van delivered to Duncan a giant new Banksy painting — “the size of a double bed” — depicting a grim reaper driving a bumper car, with the words “Brace Yourself” written on the front. A Sotheby’s appraiser estimated that the work is worth a cool $200,000, and has taken the original into storage. Brace Yourself plans to play in front of a full-sized replica of the Banksy at a gig this week. That’s kinda a big corporation move, to demand that somebody change their name because it closely resembles that name of your project. 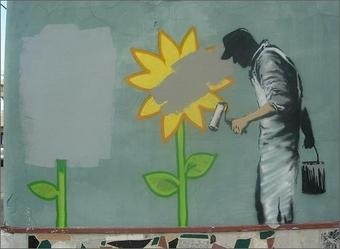 Yet, I guess Banksy wasn’t exactly demanding, he was asking, as the piece says. And, not only did he gift them with a $200,000 piece of art, he linked his name to their band and provided media exposure. I, for one, wouldn’t know anything about this band if not for a having read this write-up. Which kinda brings me back full circle again. 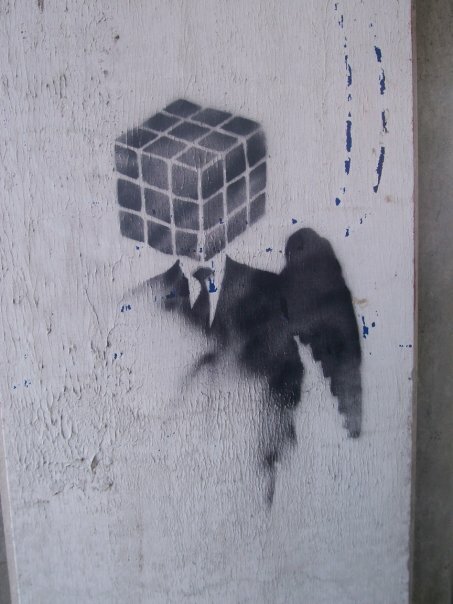 In my first post, I tried to find something to indicate whether or not Banksy had been to Russia, especially St. Petersburg, where I found a lot of amazing street art. Well, I found this great image from Russia, probably St. Petersburg, actually. 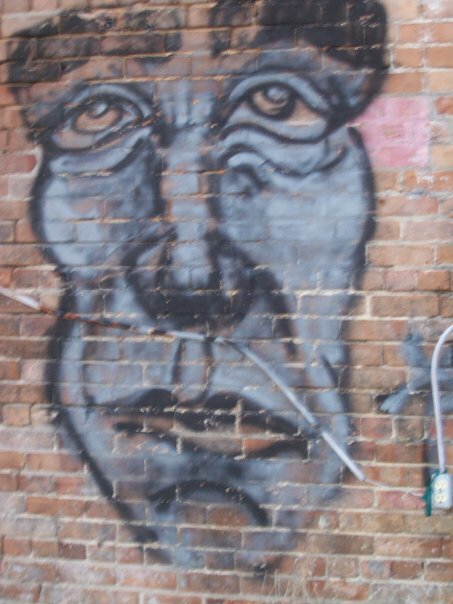 And some street art/graffiti images I’ve seen around New Orleans lately. 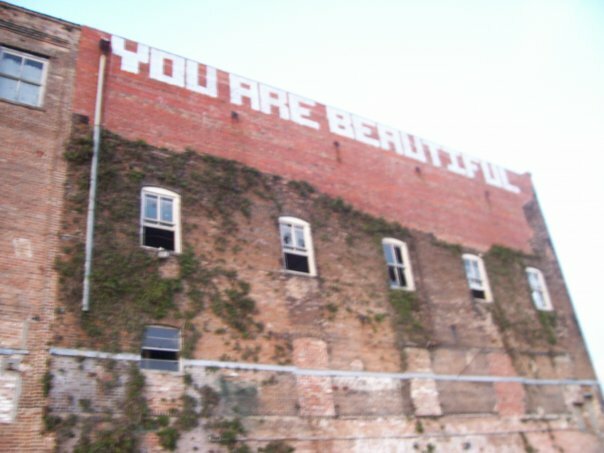 On the same building as "YOU ARE BEAUTIFUL"
Exemplifies our attitude in New Orleans, I think. 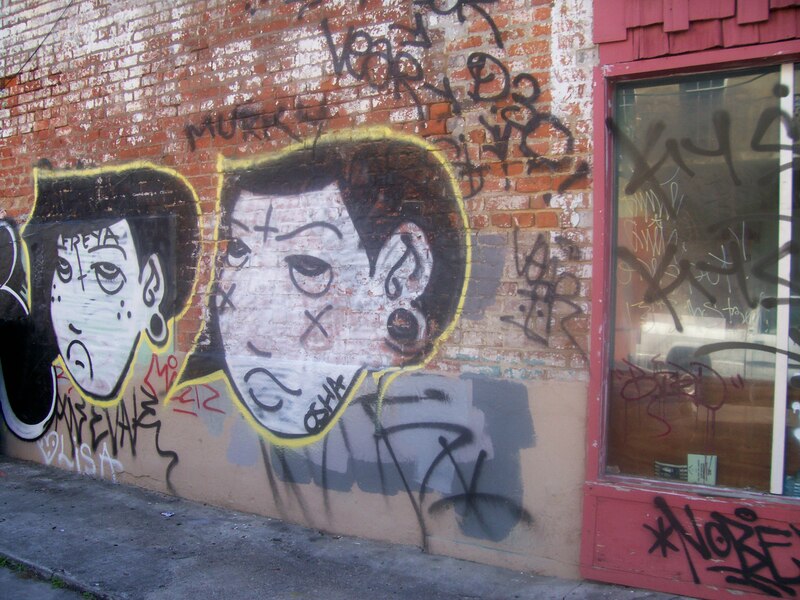 I wrote a post last year about street art. Well, the post was kind of a goulash of images and ideas I was thinking about. 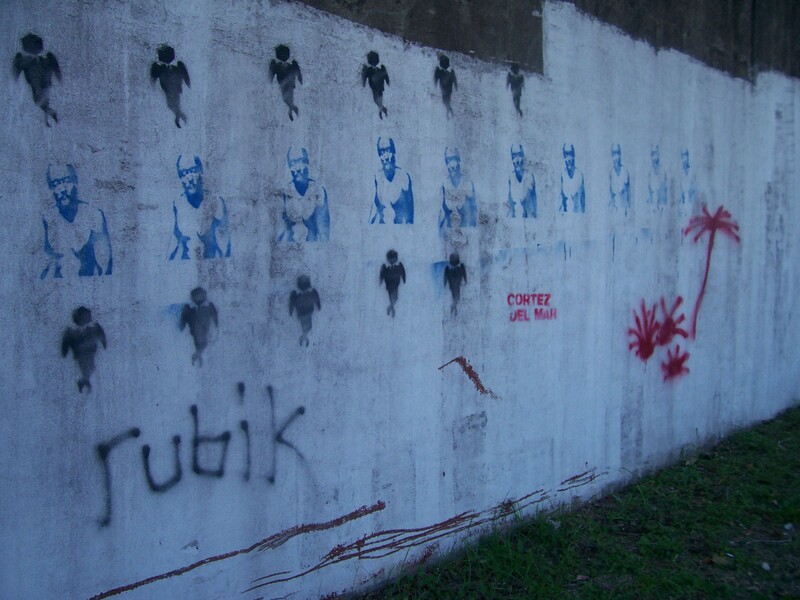 I’d been having conversations about street art, which I’ve compulsively taken pictures of for years, which made me think about Banksy coming to New Orleans. 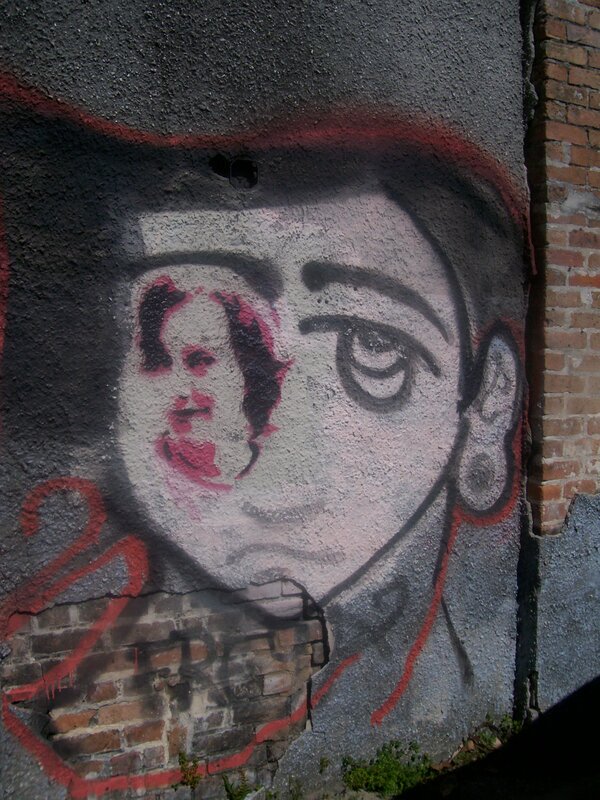 And all the street art I’d taken pictures of in St. Petersburg, Russia. 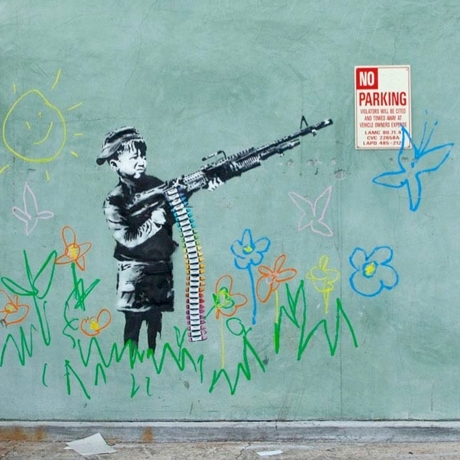 Included in that post (and the galleries of street art images), is one particular image that I kept thinking about. Just a portion of the work. 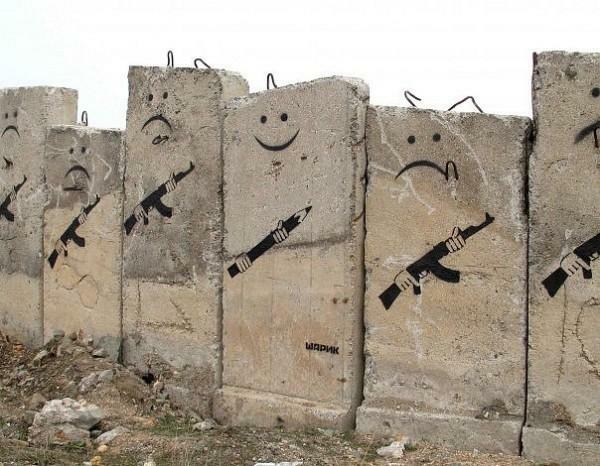 Is this street art? 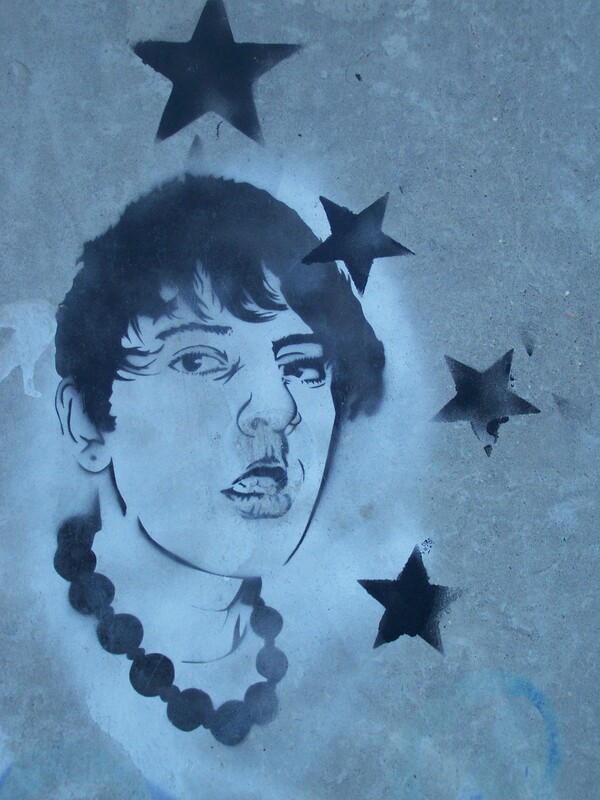 Art, yes, available as you walk down the street, yes. 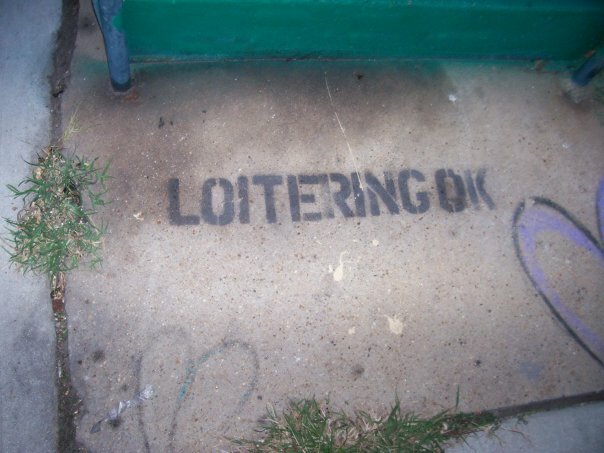 But graffiti? It takes up the entire side of a building near my house. Because of the size and the color, I wondered if it might be a mural, perhaps even commissioned by the store housed in the building. 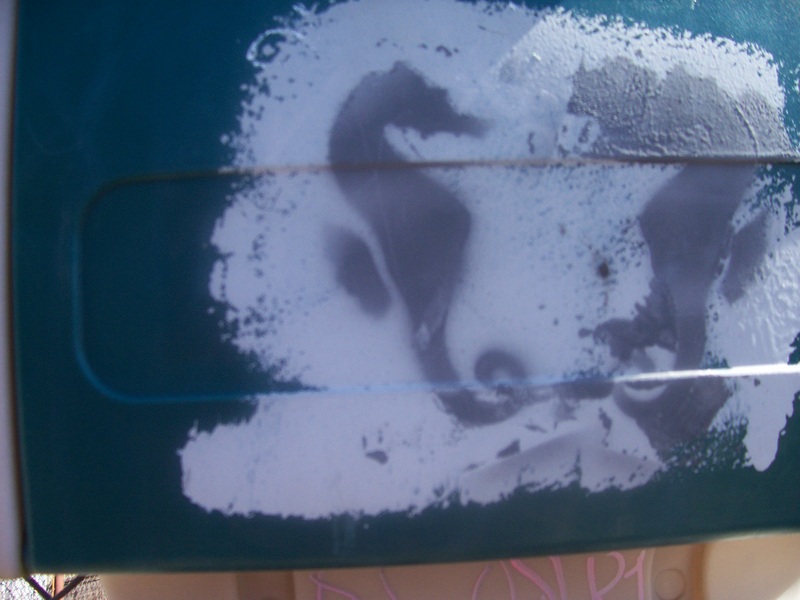 This isn’t quite the same thing as street art — which is often spray-painted and involves stencils, for the speed of execution — even if it is beautiful. Today, I went into the store Neophobia (which I’ve loved for years) and asked one of the co-owners, Amanda. She said that the artist hadn’t been commissioned by them, but they loved it when they saw it, so they invited the artist back to finish the work. She took my name and number to pass on to the artist, so if I hear from him, I’ll post again. Meanwhile, this brings to mind another debate. 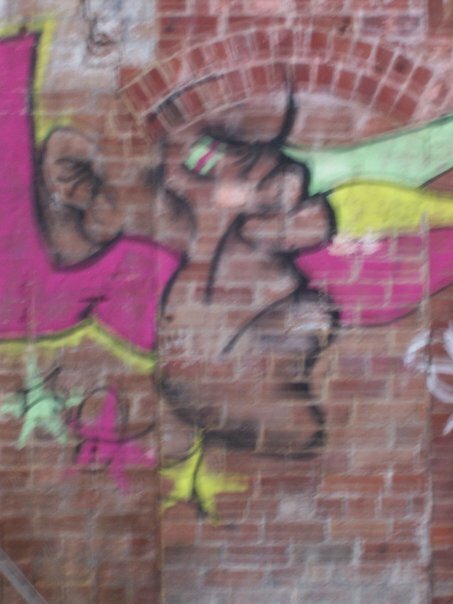 Street art can legally be considered vandalism, though people like me consider it art and photograph it. 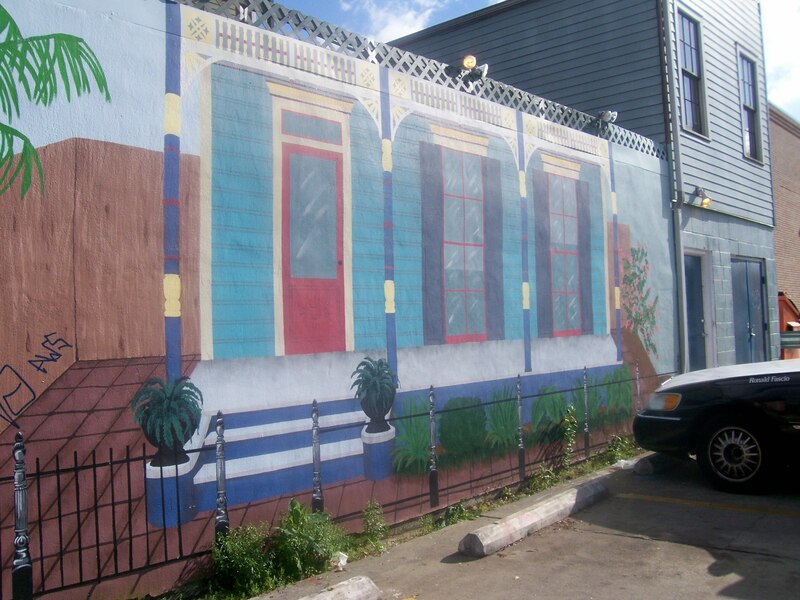 People like New Orleans’s Gray Ghost take it upon themselves to censor it. Where’s the line? 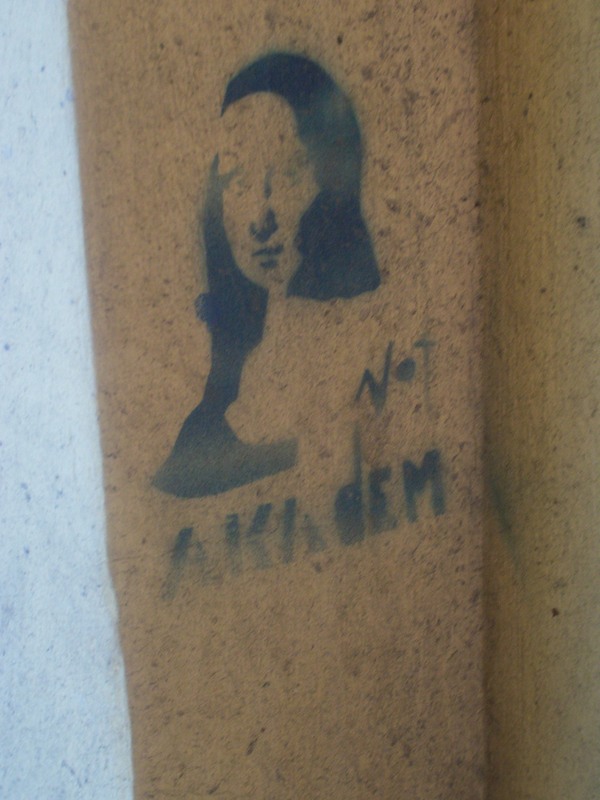 What distinguishes vandalism from art? And I’ll give you a perfect example. 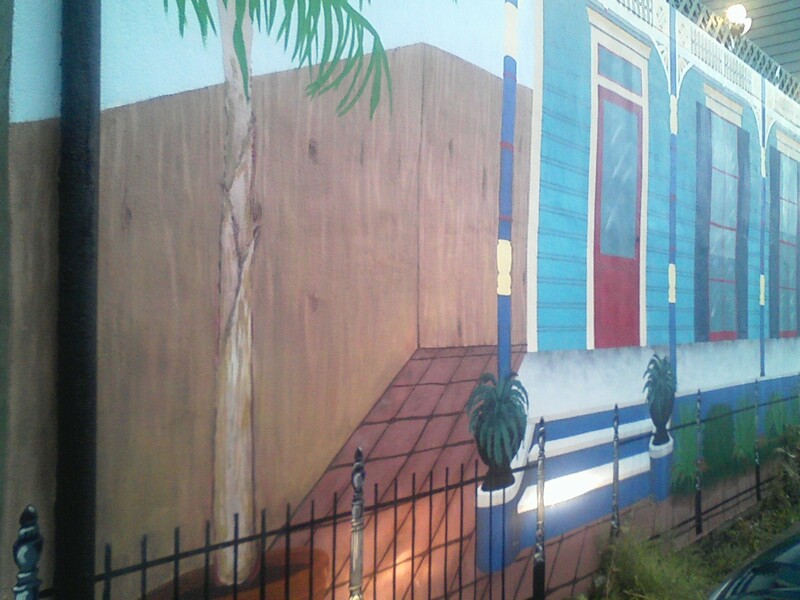 A friend of mine was commissioned to paint a mural on the backside of a local bar. 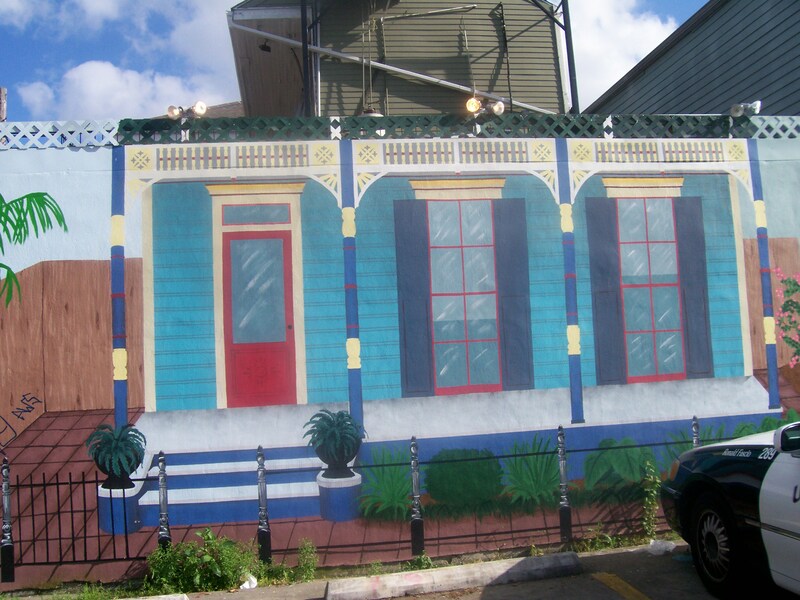 She spent weeks on it, adding incredible touches to make it look like a fine New Orleans double. And it is a nice thing to see while walking in the neighborhood, rather than an ugly white wall. Only. 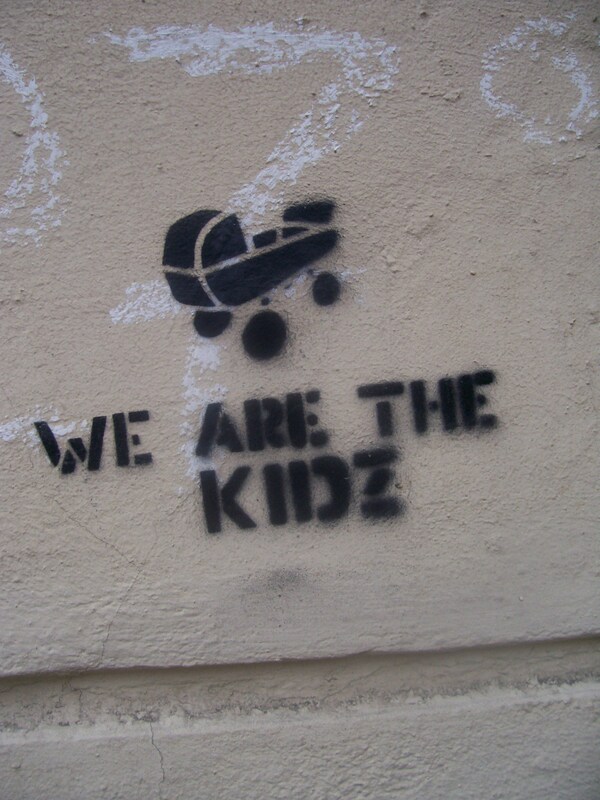 Someone tagged it. I couldn’t help but feel upset. 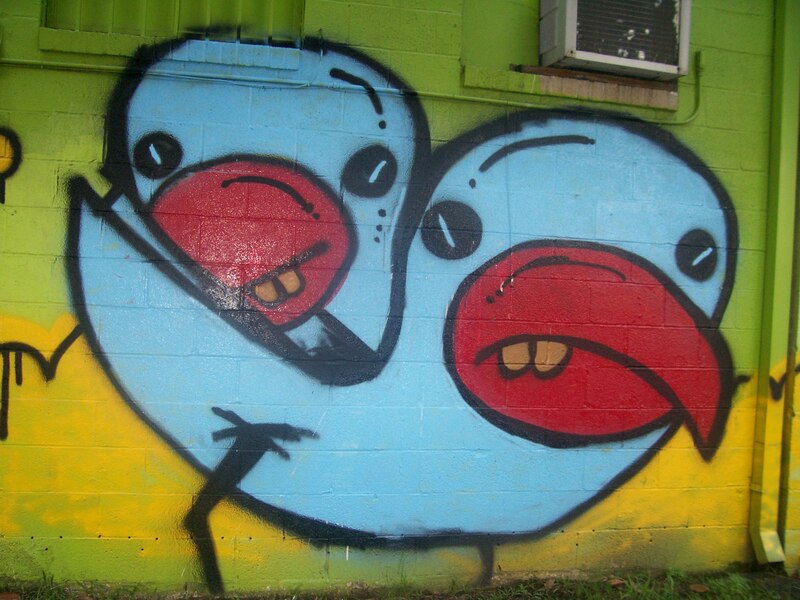 Here I am, a proponent of street art, and I’m upset by some tagging? Well…maybe it’s because I think it’s rude to tag someone *else’s* work. It’s like going up to a painting on a museum wall and signing it. Right? Judge for yourself. 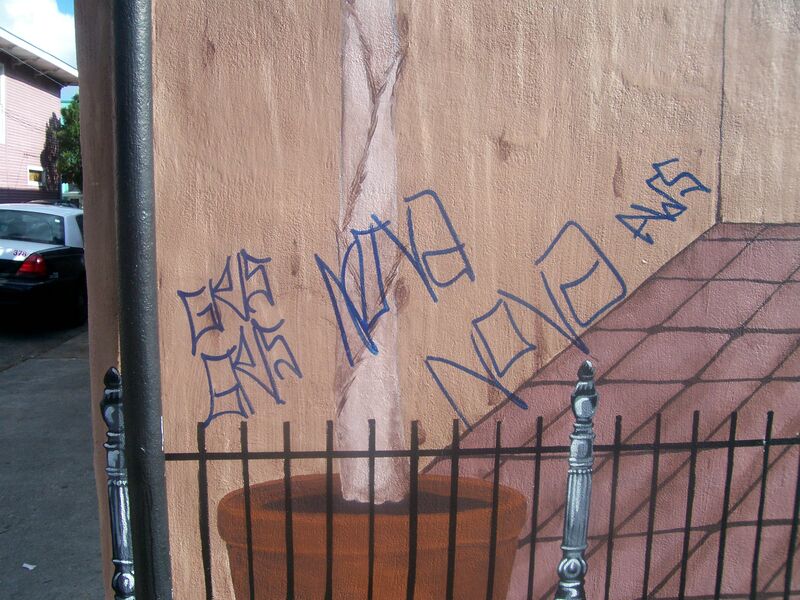 Here’s the mural (with the tag) and a close up of the tag. Lemme know what your thoughts are.